Rochester Institute of Technology appears in our ranking of the 30 Best Online Schools for Graduate Degrees. Rochester Institute of Technology (RIT) is composed of 11 different divisions including the College of Science, Kate Gleason College of Engineering, and the College of Liberal Arts. The College of Art and Design includes five schools offering 18 undergraduate and 14 graduate degrees in areas like glass, industrial design, furniture design, illustration, motion picture sciences, and studio art. All programs include experiential learning, research, and co-op opportunities to help hone each student’s skills. Students in the Photographic and Imaging Arts Bachelor of Fine Arts all take seven core classes consisting of Photo Arts I and II, Photo Technology I and II, Drawing, 2D Design, and 4D Design. The remainder of the required courses are dependent on specialty areas such as visual media, photojournalism, fine arts, or advertising. There are a variety of facilities on campus that combine the arts with other areas of study including Studio 930 which focuses on the design of new healthcare products. The Saunders College of Business offers ten bachelor’s degrees in fields like accounting, management, hospitality, and supply chain management. Freshmen have an opportunity to participate in the Biz 1+2 program which consists of lectures with local business owners and industry experts, professional development seminars, and group business simulation projects. All students also develop their own business plan during their first year while taking the required 12 business core classes. At the graduate level, there are ten different degree options including the Master of Science in Entrepreneurship and Innovative Ventures. This program requires 30 credit hours and can be completed in as little as a year. There are five required classes, Negotiations, Technological Entrepreneurship, New Venture Creation, Financing New Ventures, and Applied Venture Creation, and following this, five electives are chosen. Undergraduate students interested in attending one of the graduate business programs can take part in the Tiger Tank entrepreneurial competition to design a product and win a scholarship. There are also two bachelor’s and 18 master’s degrees offered completely online through Rochester Institute of Technology. Many of these are related to the engineering, technology, or healthcare fields. For example, the M.S. in Health Informatics is a 30-credit-hour program that combines IT, healthcare, and business with six required classes including Clinical Information Systems, Project Management, and Medical Knowledge Structures. Students then select either the Analyst or Clinical track for the remaining four courses. Related online degree options include Health Care Interpretation and Health Systems Administration. From its beginnings in 1891, Rochester Institute of Technology has always been a marriage of the liberal arts and technical sciences as it began with a merger between a literary society called the Rochester Athenaeum and The Mechanics Institute. The school is located in Henrietta, New York, a town in the suburbs of the Rochester area. Today, there are nearly 20,000 students enrolled in almost 200 different programs. All professors emphasize the importance of experiential learning, and the campus has one of the largest cooperative education programs in the world along with global campuses in various countries. In addition, almost 9% of the total student body is deaf or hard of hearing, and the school makes an effort to translate many lectures into sign language. The U.S. News and World Report has ranked Rochester Institute of Technology #43 on their list of Best Value Colleges. In addition, the online MBA degree program is ranked #26, and the photography graduate program is #6 in the country. The Middle States Commission on Higher Education (MSCHE) is responsible for evaluating the quality of colleges and universities in seven states near and including New York. As part of the continuous accreditation and renewal process, all aspects of a school are inspected including academic programs, financial standing, and administrative policies. 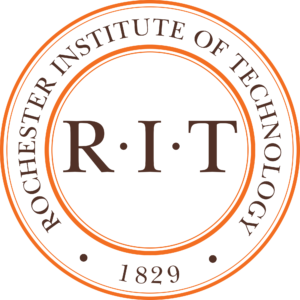 Rochester Institute of Technology was first accredited by the MSCHE in 1958, and this status was most recently recertified in 2017. There are other organizations that verify the quality of individual degree programs to ensure that the curriculum is thorough and rigorous enough to adequately prepare students for careers in the field. At RIT, the following associations are some of the many that have provided this level of accreditation. For traditional first-year enrollment, applicants can submit either the Common Application or use the RIT admissions portal. The application fee is $65, and all students also need to send official high school transcripts, a letter of recommendation, and SAT or ACT scores. For those interested in the arts, a portfolio is also required that meets specific requirements depending on the desired major. Transfer applicants only need to submit high school transcripts and test scores if they have less than 30 hours of transferable credit. Admission is competitive, and the board takes a holistic view when evaluating applications, examining extracurricular activities, desired major, and rigor of coursework in addition to test scores and GPA. At the graduate level, all students need to fill out the online application and include $65 fee, transcripts showing completion of an undergraduate degree, personal statement, resume, and at least two letters of recommendations. Some departments also require standardized test scores, a portfolio, or a writing sample. Online programs, both graduate and undergraduate, have the same requirements as the on-campus versions. Full-time campus-based undergraduate and graduate students at RIT can expect to pay around $22,000 each semester for tuition. Online tuition is assessed strictly by credit hour with undergraduate and graduate rates of $978 and $1081 per hour respectively. Students in the National Technical Institute for the Deaf program receive a tuition discount bringing the total to around $8000 and $9500 each semester for the undergraduate and graduate levels. There are a variety of other scholarships and grants available, and all incoming freshmen are automatically eligible for merit-based awards. At the graduate level, scholarships and assistantships are offered by individual department. Rochester Institute of Technology encourages all students to set up a meeting with a financial adviser after submitting a FAFSA.